Utahns are fortunate to live surrounded by an exceptionally beautiful landscape, and thanks to Brad Eaves of Staghead Designs, we can carry a bit of that beauty around with us. Based in Marriott-Slaterville, Eaves creates wedding and engagement rings for men and women, usually made with a combination of copper, naturally shed deer antler, turquoise or wood—either recycled local wood or ethically collected exotic hardwood—and durable titanium. With their harmonious bands of varying natural hues, polished to a glowing finish, the rings are stunningly beautiful in their simplicity. 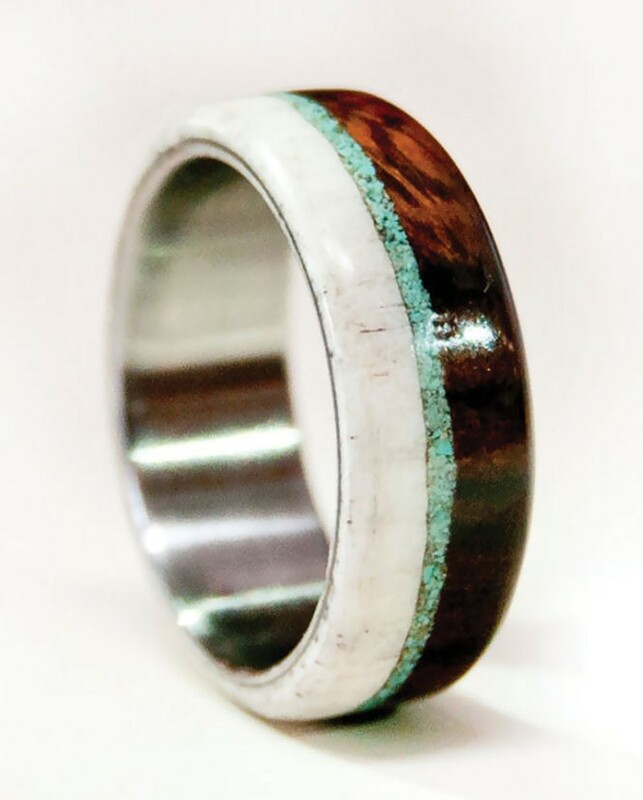 If you want to step even further off the beaten path of run-of-the-mill wedding rings, Eaves accepts custom orders for both rings and engravings, and all rings come in a clever box made from a chunk of a log. In Utah, perhaps it shouldn't be shocking when a theater patron writes an angry letter because a play includes gay subject matter. But when one such audience member complained that Pioneer Theatre Company did not warn in advance that there was a gay kiss in Ira Levin's Deathtrap—thereby subjecting her teenage son to the spectacle—managing director Chris Lino responded publicly and gracefully on Facebook. While noting that such a revelation might have been considered a spoiler in the murder mystery, he also asked the aggrieved viewer, "You object to the kissing, but not to the fact that [the characters are] murderers?" It's good to have one's moral priorities straight. Poor Yorick Studios, a massive facility managed by artist Brad Slaugh, is a haven for independent artists of various disciplines and genres, where they can to create works in private studios throughout the year. But the real highlight of Poor Yorick is its biannual Open Studio event in March and September, a night that gives patrons a chance to engage with art and local creators, enjoy live music and entertainment, and take home a one-of-a-kind creation from a local artist. It's an artistic tour you need to take at least once. Many elements of David Iver's production of Twelfth Night at this year's Shakespeare festival stood out, like the three-piece band that beautifully executed pieces for Aaron Galligan-Stierle to sing with his soulful, moving tenor as the Clown; and Melinda Pfundstein's passionate, lustful Olivia. But it was David Pichette's grasping, lecherous Malvolio who stole the show. Pichette brought both acid and preening wit to his portrayal of the sorely abused admirer of his mistress, Olivia. Yet he found sufficient humanity in Malvolio's overweening ambition that by the end of his comeuppance, it's hard not to feel a twinge of sympathy for the character's plight. 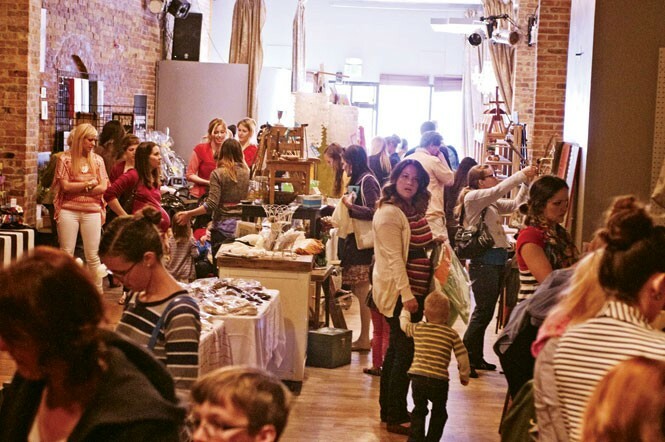 Bijou Market has had a major influence on the craft scene in Utah County, hosting biannual markets in downtown Provo for artists to share their work and encouraging people to purchase locally made goods. Each event showcases 60 carefully chosen artists, who often sell out their stock over the two days of the market. It's only a matter of time before Bijou Market grows into its own annual festival. 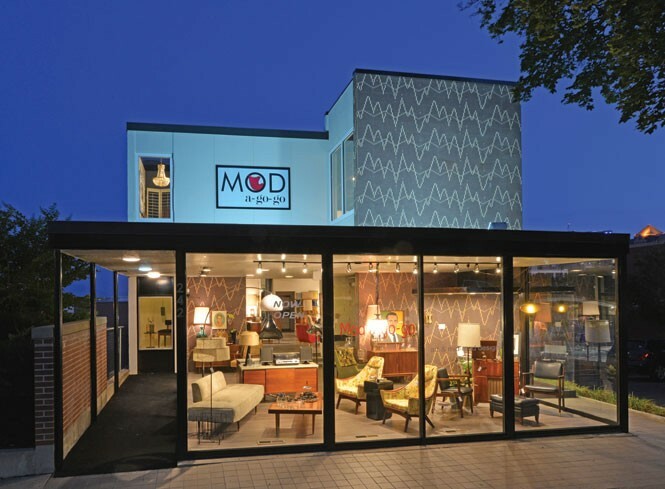 Every month, Mod a-go-go owners Marcus Gibby and Eric Morley work with dozens of creative minds to create new exhibitions for the walls of their retro boutique/gallery, which sells furniture from the '50s and '60s. Mod a-go-go also hosts massive group exhibitions during Gallery Stroll, giving art lovers a sleek, stylish place to casually chill and get to know their local creators. When you walk into the makeshift concert hall that is The Shred Shed, your eyes are immediately drawn to the woman in red on the east wall, flanked by the phrase "The Real Revolution Starts Within." The design is the work of Daniel Overstreet, whose colorful murals—found in alleys, venues and businesses—have become a vital part of Salt Lake City's downtown landscape. 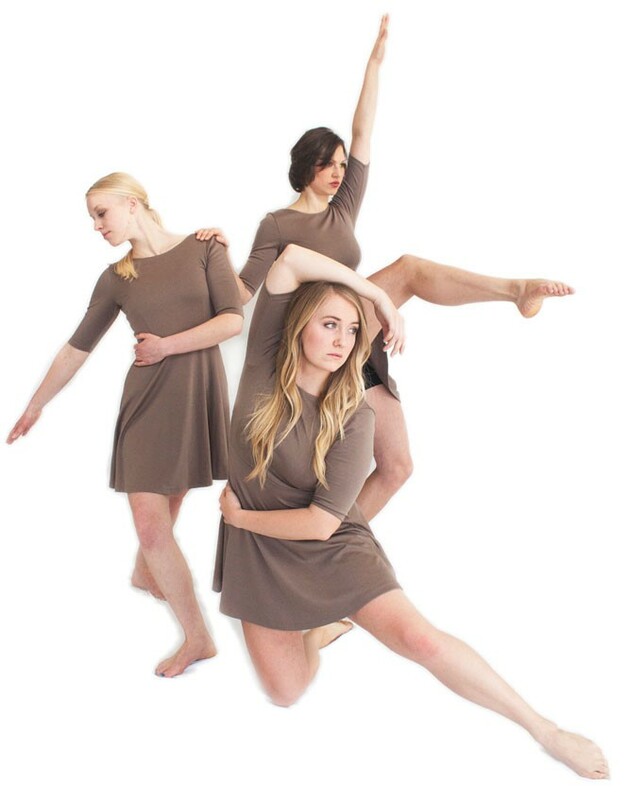 A Utah County stalwart for the past four years, Wasatch Contemporary Dance Company strives to give college grads a chance to perform in an independent dance environment. The performances are scheduled sporadically, but the company gives dancers a chance to see how an organization is run—from concept and planning all the way to final production. When these performers head off for bigger stages and brighter lights, they have a unique perspective on the business of creating art. It was a year of hard work and rapid development for popular painter Justin Wheatley. His houses got bigger and more solid; his scenes of the city got larger, grander, starker and bleak. His canvases gave a sense of barrenness, with tiny houses or hills under massive skies. And Wheatley's subjects took off in rapid, exciting new directions, questioning reality with an existentialism that comes in as many shapes and sizes as his painted structures. When Billy "The Hill" McGill was a senior at the University of Utah in 1962, he led the Utes to the Final Four while averaging an unbelievable 38.8 points per game, using an unblockable shot he invented called the "jump hook." McGill's autobiography describes both the adulation and discrimination he faced upon arriving in Salt Lake City in 1959 as the first African American player in U history. The story gets even more intriguing after he was the No. 1 overall pick in the 1962 NBA draft but never found his place in the pros and wound up homeless at 30. His story of battling back from that low point makes for an engaging read. When you wear a handmade piece from Elevate Jewelry, you're not only making a bold fashion statement—you're also "tapping into the universe's mainframe system," according to creator Prescott McCarthy, thanks to the energy-conducting properties of copper, his favorite material. Whether a simple bracelet or a necklace featuring a pendant cut into the shape of a chevron, triangle, feather or state outline, these geometric pieces are plain but striking. The process by which McCarthy heats, cuts and cools the copper brings out the metal's subtle patina, and letters punched into the copper spell out mind-expanding entreaties such as "rise above" and "elevate," or self-descriptors like "warrior" or "dreamer"—or even your own custom-ordered message. 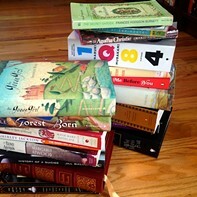 Even the most dedicated NPR listeners need a little relief from serious news from time to time. Thank goodness, then, for Consider Our Knowledge, a weekly satirical podcast written and produced by local actors and writers with a passion for public radio. The show pokes fond fun at every aspect of NPR news reports, down to the sponsorships and reporter names. We can't wait to hear the new spin-off podcast: Political Yelling With Christian Goodchurch. One of the highlights of the recent inaugural FantasyCon event in July was the addition of the FilmQuest Film Festival, which kicked off three days before the convention and showcased smaller independent films—many by local filmmakers—revolving around sci-fi and fantasy. The films were shown at the Megaplex Gateway throughout the convention, and drew packed crowds. Though local movie buffs might be used to the vibe of the Sundance Film Festival, it doesn't have to be 20 degrees to hold a successful film festival in Utah. 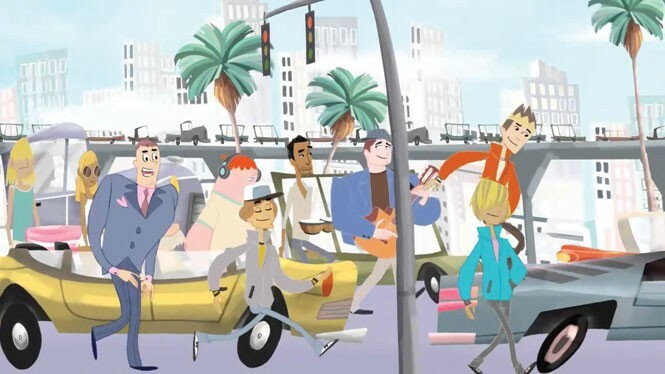 The Aquabats Super Show, a cartoon series starring the popular ska group, has been in production since 2012. And the company behind the show is none other that the independent Salt Lake City studio Too Many Legs. Founded in 2010, Too Many Legs produces affordable animated shorts and commercials and brings awesome cartoons and sketches to the masses. Jazz music fans are a passionate tribe, and they know how to support the opportunities for them to gather and celebrate that passion. The SLC Jazz Festival continues to provide a showcase not just for local artists like the Salt Lake City Jazz Orchestra and Wasatch Jazz Project, but national headliners like Sheila E and Ellis Hall. While the umbrella term for jazz can mean everything from Latin funk to big-band standards, the Jazz Festival gives audiences a way to sample a little bit of everything. 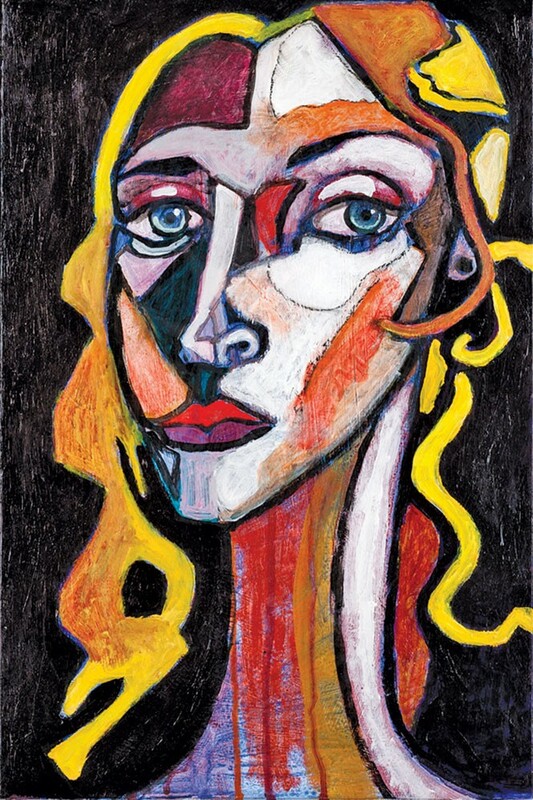 His spring show at Finch Lane was a watershed moment for portrait artist Jeffrey Hale. He filled the gallery space with new paintings, then cut half of them. The atmosphere in Hale's side of Finch Lane was part frenzied and part subdued. People entered with curiosity and exited, asking, "Which is your favorite?" With this show, Hale proved his stamina and, above all, that he's a wellspring of creative, artistic genius.